If you feel like recruiting top talent in today’s market has become harder throughout the years, you’re not alone. During this free webinar Jen Meza, VP of People at Yello and Courtney Deimel, VP of People at Imperative will dive into the details you’ll need to grow, engage and attract the right candidates by building out a robust passive candidate pipeline, and then once you have the right candidates, how you go about keeping them for days, months and years to come. With an all time low unemployment rate of just 4%, attracting and retaining top talent is essential for any brand. Top candidates are looking for brands that stand out amongst the crowd and the best candidates are attracted to the most authentic visual stories. Expert creative, direction, strategy and content branding is the core of attracting top candidates to your organization. Employee resource groups (ERGs) can be one of a company’s secret weapons. Discover how Yello—a leading TA software platform - amplifies its principles of gender equity, diversity, and inclusion through ERGs to help support talent pipeline and also contribute to the core values and principles of the company. On April 25th at 1pm CT join us as Kelly Powers and Laura Harkins of Yello’s Product Marketing and Product team walk you through the campus recruiting maturity model, sharing best practices and key features to set you and your team up for success. FREE DOWNLOAD: Campus recruiting has become a strategic initiative for succession planning and the role of campus recruiter has become increasingly important. The skills and tools needed to be successful are also evolving. As we set to embark on a new decade, and with the jobless rate at a near 49-year low, you’ll need a competitive edge to get ahead of your competition on campus this year. Meet Yello at Booth #102 to test out the talent acquisition platform used by the world's leading brands. From sourcing through hiring, Yello's product suite helps recruiters love what they do. Meet Yello in the Expo Hall to test out the talent acquisition platform used by the world's leading brands. From sourcing through hiring, Yello's product suite helps recruiters love what they do. Meet Yello at Booth 718 to test out the talent acquisition platform used by the world's leading brands. From sourcing through hiring, Yello's product suite helps recruiters love what they do. Meet Yello at Booth #214 to test out the talent acquisition platform used by the world's leading brands. From sourcing through hiring, Yello's product suite helps recruiters love what they do. Join Yello for #STRIVE19. Yello’s 10th annual conference will offer inspiration and education to power your talent acquisition program for the future. Meet Yello at Booth #701 and #800 to test out the talent acquisition platform used by the world's leading brands. From sourcing through hiring, Yello's product suite helps recruiters love what they do. According to the International Workforce Group, over 70 percent of professionals work remotely at least one day per week — creating the perfect landscape for A.T. Kearney to build on-campus connections without a physical presence. Today, A.T. Kearney recruits at more than 60 of the nation’s top business, engineering and liberal arts schools, and hopes to expand their reach even further. What are the macro trends impacting career services and university relations and recruiting professionals on a global and national level? What shifts in perspective and direction do these require us to make? Join NACE colleagues for this collaborative career services and university recruiting and relations session. It’s estimated that talent acquisition teams can spend up to 65% of their time on interview scheduling. In a forty-hour work week, that means more than three days are devoted to scheduling alone. That’s why Yello is excited to announce Interview Day Scheduling, the final piece to our scheduling solution. 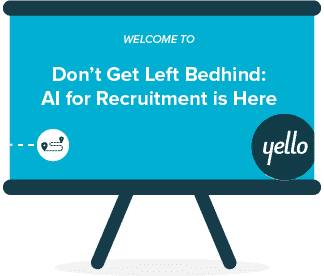 With this release, Yello infuses artificial intelligence (AI) to finally solve for the complex scheduling logistics associated with interview days. Seal the Deal with Candidates: Demonstrate Your Commitment to Diversity. When it comes to diversity recruitment, you can’t afford to wait around—discover how to seek out candidates with diverse backgrounds and life experiences with this one-stop shop toolkit. Today, 61 percent of CEOs do not believe they are recruiting fast enough or well enough, and the process has become enormously complex. Can AI step in to solve these challenges? This HR.com research report debunks common myths about artificial intelligence to reveal exactly how recruiters should expect to incorporate AI into their work—both today and in the future. Research from Brandon Hall Group finds that organizations with strong interviewing strategies are more than twice as likely to make quality hires. Read this report for the best practices you need to repair your broken interview process and hire top candidates. FREE DOWNLOAD: Listen in for a veteran recruiting focused webinar. 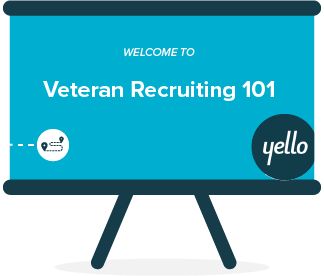 During this webinar, we cover different myths of veteran recruiting, best practices, the value of hiring veterans, and ways you can utilize Yello to leverage your veteran recruiting. Discover how to transform your interview experience from risky to rewarding. We examined and shared examples on the best ways to mitigate the dangers in your candidate interview experience, and how automation and strategy may be the key ingredients your organization is missing. If you’ve used Google Maps to find the best route based on traffic conditions, asked a question to your phone's smart assistant or listened to a personalized playlist created by a music streaming service, you’ve interacted with artificial intelligence (AI). As AI begins to change the way we interact with the world, from the way we navigate, how we watch television, to the music we listen to, how can we expect these changes to affect our work and how can we prepare? FREE DOWNLOAD: When it comes to hiring the best talent, employers need to lure job seekers with more than generous salaries, office snacks, and bean bag chairs. New research finds that two-thirds of employees consider diversity a key factor when considering whether or not to accept an offer. Join this webinar to understand diversity directly from the perspective of job seekers and employees. Do you have what’s needed to attract and hire the high-quality talent to propel your company forward? If you’re ready to invest in your company’s next generation of talent download this toolkit today to access the resources you’ll need to rev up your hiring experience. Even the most experienced talent acquisition leaders can hit roadblocks leading a high-performing recruiting team. We’ve compiled the top challenges recruiting leaders face and have identified solutions that will help you and your team avoid any recurring frustrations. A lack of commitment to diversity and inclusion will cost you, leading to lost candidates and increased employee turnover. In fact, nearly 66% of employees consider diversity and inclusion an important factor in the decision to accept a job. Read this report to find out what today's workforce thinks about diversity and inclusion practices in the job search and workplace. Whether or not candidates become employees, their experience with your company—from discovery to hire—will have a direct impact on your organization’s overall brand. Use this roadmap to ensure your talent acquisition team provides the best candidate experience throughout every phase of the interview process. FREE DOWNLOAD: Join us for College Recruiting 101 as our panel of experts discuss the fundamentals of creating budgets to help ensure successful recruiting outcomes while minimizing the impact of unexpected fees and costs. FREE DOWNLOAD: The recruiting industry is awash in technology related to recruitment marketing, candidate discovery and assessment, videos for interviewing and employer branding, de-biasing, scheduling, and artificial intelligence; where does one start when figuring out the toolset for their organization? Join Frank Sprague, senior manager of recruiting and sourcing at Blackboard as he shares the information you and your team need in order to navigate the overwhelming landscape of recruiting tech. What is the key to developing an early talent pipeline? A well-managed, highly effective campus program. A successful campus recruiting operation will lead to a pipeline of top, entry-level candidates recruiters can tap for future hires. Ensure team members are prepared to run a high-performing campus strategy, that yields a strong pipeline, by following these fall event success plans. A global, fast-growing technology company with a workforce of more than 1,500 faced a challenge: they needed to recruit future leaders to keep up with the organization’s continued growth. To accomplish this, the company needed a technology partner who could streamline the way they manage relationships with individual candidates, and scale their efforts to create an authentic, culture-forward experience for every prospect at nearly 75 career fairs globally. athenahealth, a leader in healthcare technology, recruits at universities across the country to fill internships and entry-level positions in high-tech fields. They want their presence at campus recruiting events to reflect their commitment to innovation in the healthcare sector. The hiring market for entry-level technical positions in the healthcare field continues to be highly competitive, and athenahealth needed to stand out from the competition to attract top talent. Cielo was among the first in the RPO industry to integrate technology into talent acquisition strategies. As hiring needs increased around the world, they wanted to continue to innovate by developing a technology model that delivers an interactive, high-touch recruiting experience for candidates in every industry and location. Cielo hoped to accelerate hiring and bring consistency to recruitment operations, while increasing candidate engagement. 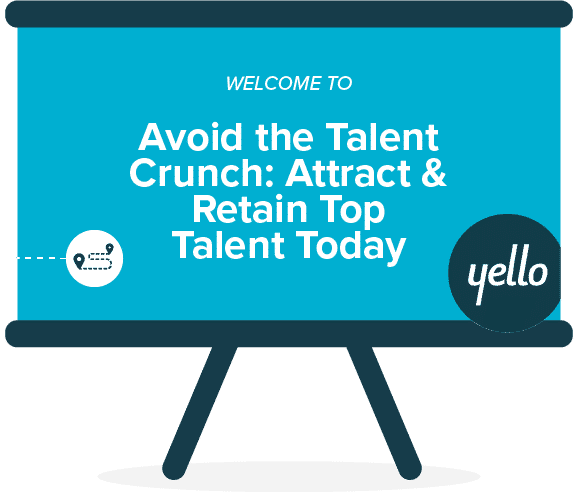 The 2018 Yello Recruiting Study: Demographic Deep Dive reveals thought-provoking statistics to help talent acquisition leaders make strategic hiring decisions. New research from Aptitude Research Partners identifies the key ways employers can become more strategic in their campus recruiting efforts to increase quality of hire and overall business impact. With nearly 70% of companies hiring new college graduates this year, only the companies that adapt their campus strategies and utilize time-saving technologies will come out ahead. The 2018-2019 school year is here. Is your college recruiting team ready? If you’re still reviewing your career fair schedule or fine-tuning your campus strategy, we’ve created a toolkit that will help you prepare. Download this toolkit to access the resources you’ll need to optimize your on-campus presence. FREE DOWNLOAD Transform your interview process! Do you wish your team could spend less time coordinating efforts and more time having strategic conversations? In order to hire the right talent, at the right time and on budget. This guide offers insights into the motivations of your target audience - millennials - and provides direction on how to lead your recruiting department to best engage with this group. If you’ve attended a campus career fair and come back to the office feeling defeated, you’re in the right place. This guide compiles all the knowledge you need to gain the most from the campus recruitment experience. To stand out in a crowded marketplace, it’s important to continually evolve how you attract candidates. If you have been following the same job description format, promotion avenues and application process, now is the time to update your strategy and get ready for the fall recruiting season. An internship program is the gateway to the largest and often most enthusiastic future employees. Whether your company is a Fortune 500 or a high-growth start-up, internship programs can provide fresh perspectives, build robust talent pipelines and can improve recruitment marketing efforts. Does every job requisition that crosses your desk immediately fill you with panic? Avoid that pit-in-your-stomach feeling by proactively building and maintaining a reliable source for the best candidates: a robust, high-quality passive candidate pipeline. An engaged candidate pipeline is key to your company’s long-term recruitment strategy. To successfully attract these candidates, a talent community is the first step to authentically capture their interest. The toolkit you need to sell your leadership team on the value of measuring ROI, automating candidate communications, eliminating paper resumes and more. A formalized recruitment event program can eliminate disorder and provide all stakeholders a clear understanding of event expectations. This guide will discuss common recruitment event challenges and solutions to better manage these processes to create a streamlined event experience for both recruiters and candidates. Companies that lack transparency in their recruitment processes will not win top talent. Are you providing candidates with the information they need to make an informed decision? An engaged talent community is key to nurturing passive candidates. However, many organizations encounter problems when trying to launch, run and improve this important resource. Download this guide to find out how an effective talent community can be the key to a robust talent pipeline. Delivering the ultimate candidate experience begins before the first handshake and ends after an offer has been extended. The experience candidates have with your company impacts their decision to accept a job and affects your recruitment brand. Learn how to keep the candidate experience at the forefront of the recruitment process. The 2016 Yello Recruiting Study analyzes what motivates recent grads, what these candidates really want and what messages resonate most as they explore finding a job and career. FREE DOWNLOAD To achieve campus recruitment goals, companies must rethink traditional university programs. Join this webinar to learn how to implement a strategic campus recruitment program to improve quality-of-hire, candidate communication and overall campus recruitment ROI. A well-planned campus recruitment strategy is essential to hire top student talent. Follow this checklist to maximize recruitment efforts at every career fair. Is your recruitment department operating at peak health, or do you need to schedule a checkup? Calculating key recruiting metrics are essential to assessing the health of your talent acquisition team. Meet us at the 2018 Grace Hopper Celebration, the world's largest event for women in technology! Stop by Booth #5846 to say 'hello' and schedule a demo to see how your talent acquisition team can recruit more efficiently with Yello. Meet us at the National Black MBA Association (NBMBAA)! Stop by Booth #1509 to say 'hello' and schedule a demo to see how your talent acquisition team can recruit more efficiently with Yello. **An Exclusive, Client-Only Event** Join us in Dallas on August 1 to share best practices amongst peers and discuss how your talent acquisition team can recruit more efficiently with Yello. Location: WeWork Dallas. This study includes comparison metrics from five 2016 diversity events — Prospanica, Grace Hopper, NBMBAA, SHPE, WE16 — to gain insight into the results of the 2016 diversity conference season.